Metrowest Prosthodontics provides dental bridges in Framingham, MA. Call 508-620-6622 today to learn more and schedule your appointment. A traditional dental bridge is a fixed appliance cemented in the patient’s mouth to replace a missing tooth or teeth. The adjacent teeth will be prepped for the abutment crowns and an impression will be taken of the area and a bridge will be fabricated by a dental lab. The patient will leave with a temporary bridge and return to the office a few weeks later to have the permanent bridge cemented in place. An implant supported bridge is similar to a regular dental bridge, but it is supported by implants and not by natural teeth. In most cases but not all, when an implant-supported bridge is used, one implant is placed in the jawbone for each missing tooth. Then the crowns are connected to each other to form one piece. This option is very helpful where there are one or more adjacent teeth missing. This option provides a very secure option to restoring missing teeth. 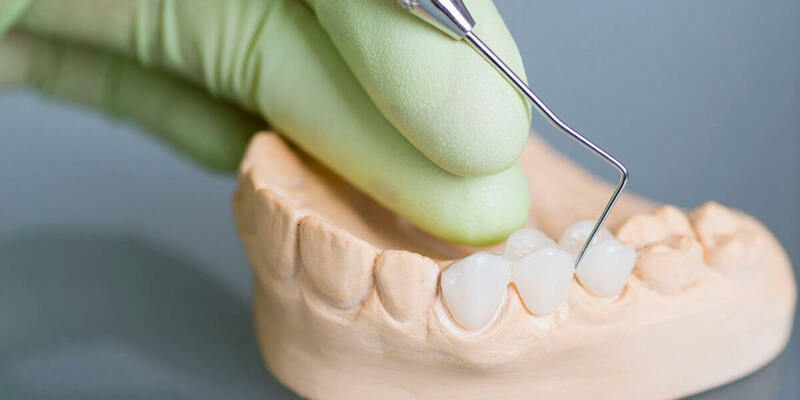 Dental implants are placed using the implants as support, thus the natural teeth on the abutment sides of a traditional bridge are not involved. The implants will be covered with the abutment and crown, the pontic will be connected to the implant crown abutments on either side. This ridge option takes longer as the implants must integrate with the bone.